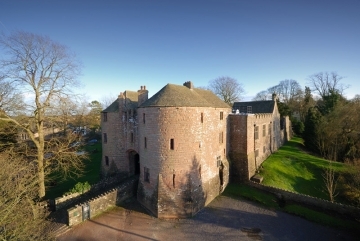 St. Briavels Castel is a Norman castle that was originally built between 1075 and 1129 as a royal administrative centre for the Forest of Dean. However, in the 13th century King John liked it so much, it became his favourite lodge for regular hunting excursions into the nearby forest. The castle is steeped in history having been a regular favourite with many royals over the centuries while also being used as a court and a notorious debtors’ prison. One of its most striking features is its huge Edwardian gatehouse that welcomes you into a truly memorable stay. 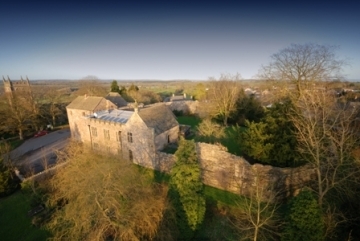 The castle became a youth hostel in 1948 and ever since has been offering guests a unique glimpse of medieval life in England. Many of the original features used to keep out uninvited guests such as the three portcullises of the gatehouse passageway, and the castle’s octagonal spurs originally designed to prevent undermining, are now there to tempt you in. Overlooking everything is the famous ‘Forest Horn’ that sits on top of the castle’s chimney marking the headquarters of the monarch presence in the Forest of dean. St Briavels Castle Hostel has 4-6+ bedded rooms and facilities include kitchen and evening meals. 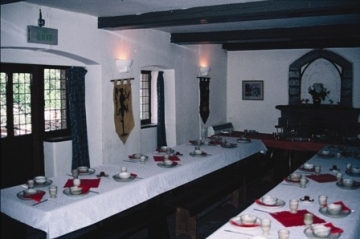 Medieval banquets are offered most Saturday evenings and offer a wonderful opportunity to enter into the ancient spirit of this medieval building. The castle is a great family favourite and the kids are sure to enjoy the period dress-up box to re-enact a few battles for themselves. Seasonal activities on offer also include archery and bread making. Located right on the western edge of the Forest of Dean, the castle hostel is a great base to explore one of the last surviving ancient woodlands in England. The Forest of Dean is the second largest crown forest in England with wonderful oak, beech and sweet chestnut trees and wildlife including wild boar, fallow deer and peregrine falcons. 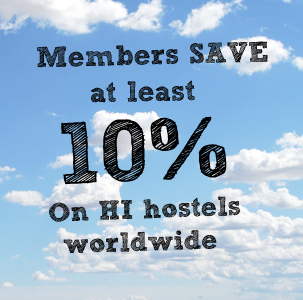 Further details and booking availability for St. Briavels Castle Hostel is available here. my family and I had an incredible time here in 2002 —gorgeous country and fascinating history. actually getting to stay in a real medieval castle was one of the best memories of our whirlwind trip thru the UK. FABULOUS!!! I went there for a YHA Camp for kids. So I didn’t experience a normal day there however the whole idea of staying in a castle was exciting and the grounds/backgarden were big enough to play lots of different games. A must for any family with kids.